Remington’s fuzz away fabric shaver removes excess fuzz and threads from fabric in one simple step. 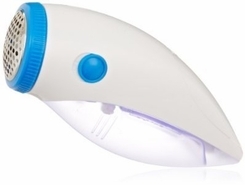 The fuzz away fabric shaver is perfect for keeping your clothes in pristine condition. This lightweight, easy to use, and space-efficient unit uses its precise t-blades to quickly and safely remove any threads or fuzz. The product can be used on any type of fabric and has a removable storage compartment. The unit requires two AA batteries.